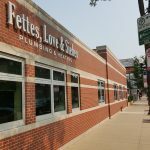 Sandz Development Company, Inc. has played a vital role in transforming Lincoln Park into one of Chicago’s finest neighborhoods. Over the years, Sandz has developed a number of signature properties throughout the North Side, including Dickens Court Townhomes, Eugenie Terrace Townhomes, The Whitney, and 530 and 600 N. Lake Shore Drive. Today, the team, which includes Zisook, David Goldman and Ryan Goldstein, is writing a new chapter in Lincoln Park’s storied evolution with the development of Webster Square. Located at 558 W. Webster Ave., at the intersection of Webster and Lincoln Avenues, Webster Square Apartments is part of the larger Webster Square master-planned community, which is the redevelopment of the former Lincoln Park Hospital site. The development will also feature a 12-story luxury condominium building, eight single-family homes on Grant Street, a 255-car parking garage, and Mrs. Green’s Natural Market, which opened last year. Apartments at Webster Square offer smart, sophisticated living spaces complemented by upscale finishes and great views. This newly transformed building was in need of window treatments that would sufficiently maintain the great views of its surrounding neighborhood while being capable of controlling and decreasing the harmful effects of the sun. Certain areas and rooms of the building required more shading and/or privacy than others. The Webster Square Apartment building was susceptible to high levels of UV, unfiltered sunlight, and natural heat due to being surrounded by a park and mainly residential area. Without the proper solar control solution, these negative aspects can have a harmful effect on furniture, flooring, décor, and can be a nuisance to tenants. – All woven mesh shades were fitted with Mermet E-Screen fabric White/Pearl #0207 . A combination of 1%, 5% and 10% openness were selected to the customer’s specifications. A total of 440 Illinois Window Shade Company Clutch Operated Roller Shades were installed on windows throughout floors 2-6. These shade systems were dressed with solar control fabric (Mermet E-Screen in White/Pearl) and were controlled by heavy duty clutches with a #10 stainless steel bead chain. A total of 21 clutch operated shades were installed on the windows of the Party Room and Fitness Room on the 7th floor of the building. All were dressed with Mermet E-Screen White/Pearl. A total of 51 clutch operated shades were installed on windows throughout the 1st floor of the building. Each with solar control fabric (Mermet E-Screen in White/Pearl) and heavy-duty clutches. To preserve the view of the exciting Oz Park and the beautiful downtown Chicago skyline, shades with a 10% openness factor were used in the living room of each unit. These shades will also greatly decrease glare and UV which can damage furniture and floors over time. Shades with 5% openness were used on windows in the Party and Fitness Rooms on the 7th floor of the building. This percentage of openness was chosen to preserve the view of the trendy outdoor patio as well as the Lincoln Park neighborhood. The ground floor of the Webster Apartments were going to be used for commercial space, therefore shades with 10% openness were used on each window to properly shade the interior while simultaneously providing staff with a crisp, clear view through of the exterior. For tenant privacy, solar shades with 1% openness were used in units with bedrooms. These shade systems will filter sunlight as well as control temperature and provide privacy. Finally, to completely conceal the components of the roller shade system, 3” square fascia was applied to each shade in the common areas. The anodized aluminum color was chosen to match the modern interiors. IWS created a shading system that would not only be easy to use but would also be tailored to fit the needs of each area of the apartment building that they were installed into. 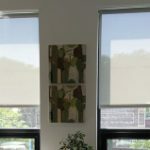 These shades systems increased energy savings, blocked harmful UV, and provided tenants with a comfortable living environment. All units in the Webster Square Apartments are now equipped with the highest quality solar control solution available. The clutch operated shade systems ensure years of worry-free, simple usage and the solar control fabric thoroughly filters all sunlight and provide privacy where needed. As a result of transparent, light-filtering fabric being used on each shade, tenants can enjoy views of Lincoln Park while remaining protected from the harmful effects of the abundance of sunlight their apartment building naturally gains. The shades also provide a look of sophisticated uniformity for prospective tenants viewing the building from the exterior.